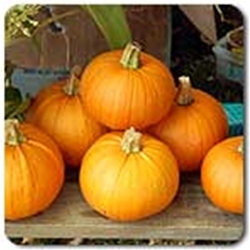 Pumpkins are thought to be native to North America where pumpkin seeds from 7000 to 5500 BC have been found in Mexico. Pumpkin seeds are high in manganese, magnesium and zinc, and pumpkins themselves are loaded with Vitamin A in the form of beta-carotene. All plants are certified organic. Available in a four pack. Select here for transplant information, pick up and order dates.